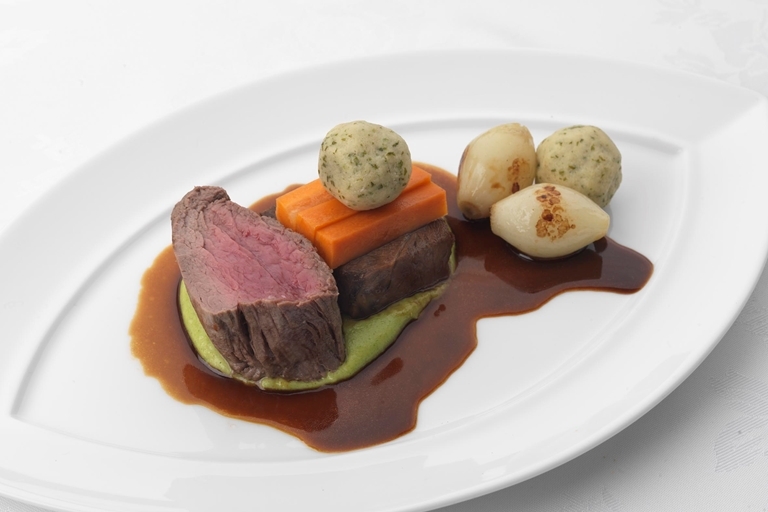 Phil Carnegie's Scottish beef fillet dish served with sous vide featherblade and extra special bone marrow dumplings, is a week long job. You can, however, be inspired by this exquisite beef fillet recipe and tweak it by cooking the meat in a more traditional way, perfect for a top notch sunday roast. For the watercress purée, bring a saucepan of salted water up to a boil, then add the watercress and cover the pan with a lid. When the watercress is cooked, drain it well, then refresh under cold water. To make the red wine jus, heat a saucepan over a low heat. Squash the garlic cloves and drop them into the pan along with the wine and the rosemary. Allow to simmer over a medium heat until the liquid has reduced by half.